Everyone that knows me knows I love horror movies. And I’m especially fond of zombie movies and shows. The Walking Dead is one of my favorites! Can’t wait for the new season to start. 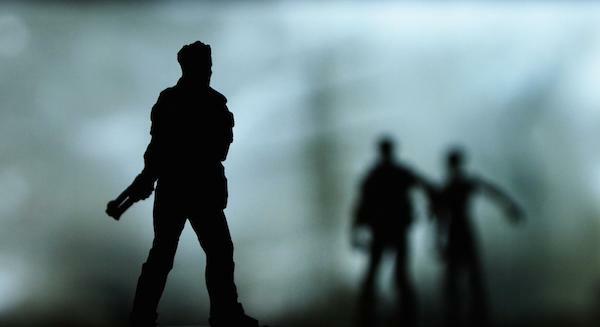 This got me to thinking about zombies (and I’ve written about zombies several times here on my blog) and ways living as a zombie beats normal life (and in the spirit of Halloween coming up)…. Have you ever watched a zombie from a distance? You can throw anything at them including a bullet and they will just keep on lumbering along. Nothing makes them fearful or afraid. They simply moan and keep on chasing. That has to be a bit liberating, no? We all know how we love those days off where we get to run around our homes in our yoga pants. Zombies live their entire lives like that. No worries about embarrassing angles or things showing…. they simply let it all loose and roll with it. I can only imagine what that freedom feels like. If you are a zombie, you don’t need currency. What are you going to buy? Better still, who is going to sell you anything? Your life is simplified a great deal when you only live for brains and flesh. You don’t even have to go to work each day. I wish I had the self confidence of a zombie. A zombie walks around with half an eyeball, missing teeth and a really bad odor and never feels upset about it. They can ignore the name brand on their sneakers and simply be who they are. You never see a zombie putting on airs. Zombies are actually fairly noble when you think about it. They never pretend to be someone they are not. They are too simple for that. Yes, they will eat you and turn you into one of them, but at least they are honest about it. Zombies do have some advantages, huh? I saw the title and was a bit confused. But now I see! Such a funny lighthearted post – very true points you have here though too! It definitely made me smile! Thanks! That’s hilarious! But what about the smell? Lol! Love it, thank you, you made my day. I want to be a zombie then! Hahahaha. FINALLY! A blogpost for my people! Being a “zombie” myself, I believe you hit most of the high points of our “lifestyle”,which, by the way, is a choice. Thank you for shining a light on our community. AARGH! hahaha. funny. people actually don’t look at the bright side if they talk about zombies.